All of us have seen the ads on the internet about working from home. You don’t have to pay a baby sitter, no expense for gas traveling to and from a job. Work at home and earn more money than you ever dreamed possible with just the click of a button. That is what you hear from all the internet “gurus”. If the program being offered sounds to good to be true, it probably is! Someone is trying to sell you some software which might work, but not as efficiently as they claim. Unfortunately the online marketing niche is riddled with scam artists. For every legitimate program there is, there are at least 60 that are scams. Some of the red flags to look for are number one is their sales page only 1 page with a video. There’s not much depth there. Have you found out how to contact the company? If you can’t contact them how are you going to get support. Are they offering a long time guarantee, it is probably a very poor quality product. Do they start out with a high price tag and when you don’t bite do they keep lowering the price. Eventually can you buy the product very cheap? If so be leery, it’s probably bogus. Once they get you hooked then they start trying to get you to buy upsells costing into the hundreds of dollars. Can you try the product for free for a limited time? If not it’s probably an inferior product that can’t help you learn affiliate marketing. If it were a legitimate product they would be willing to let you sign-up for a period of time for a test run. While searching on line for information, if the site you are checking out brings you to a video showing a mansion, fancy cars and swimming pools and exotic vacations and don’t forget the boat and airplane. That should send you running right away. That’s not how it works. Promises of money with just the click of a button, without any ” hard work”. *Videos of the promoter living in grand homes and driving sports cars costing 100s of thousand dollars. *Screenshots of clickbank or other affiliate programs of large commissions being earned. *Offers that just seem very easy to implement. Affiliate marketing take time and hard work. I can speak from my heart. I got caught up in a couple of scams like those. Fortunately, my husband didn’t want me to buy anything unless I researched it very well. But I did get taken for a seminar for three days for $1,000. For 3 days, in the morning, they showed us all kinds of information about earning money with affiliate marketing. In the afternoons we were pitched to about buying a better program to the tune of $9,000 to $36,000! People were leaving their life savings with these SCAMMERS. I didn’t have that kind of money to spend, not that I would have. But there were many people in that room that parted with a lot of money. I have always wondered how they made out. program. For at least a year they kept trying to contacting me. Since then I have purchased a few inexpensive courses. I was working on one of them when all of a sudden I was not able to access it any more. They had closed their website down. Fortunately I had studied it enough to know how to get a website set up. But I had paid for it so I thought it was mine. More money down the drain. Research everything you are interested in purchasing. There are a lot of good sites about scams and a lot of good review sites to help you differentiate between what will work for you and what to stay away from. Make sure they have a return policy in case after a few weeks you don’t feel it’s right for you. Don’t be afraid to return a product, I have a couple of times and I never had a problem with Paypal. Always got a refund without question. Sometimes you have to kiss a lot of frogs before you find a prince. If you are looking for help getting started my advice to you would be to read this review. 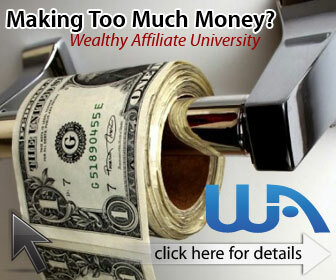 It will give you all the in depth training for affiliate marketing and the best part is that joining is free. Click here to read my review. I would appreciate any comments and I will get back to you.